"Come, thick night, And pall thee in the dunnest smoke of hell, That heaven peep not through the blanket of the dark, To cry 'Hold, hold'"
Every roof-climber in Cambridge probably started on his errant course in the same way, namely, by climbing into college. The monastic seclusion into which a college draws itself at night begins at ten o'clock, when the gates are closed. At midnight the porter goes to bed, and no one may enter without a previous late leave from the proper source, dean or tutor. This is granted grudgingly, and is apt to be refused. A man who asks for it repeatedly feels an official coolness gazing askance at him. And even for coming back between the hours of ten and twelve he is fined a few pence, the exact sum varying from college to college. Thus, whether to save gate-money or to remain a blue-eyed boy with his college dean, many an undergraduate sooner or later finds himself looking for an inconspicuous mode of entry into college. Why pain the dean, he argues to himself; why rouse the porter from his snores? And forgetting all the good advice of his youth, the tyro becomes naughty, and studies the problem of climbing in. Now comes his first difficulty. He finds that the authorities have anticipated his naughtiness and barred the ground-floor windows. 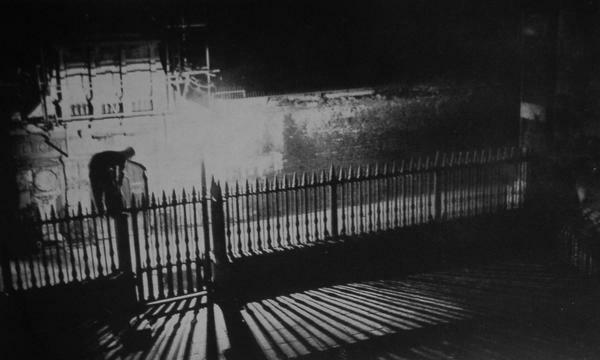 Wandering round the college, he finds that the obvious ways are guarded by revolving spikes, which are apt to spin under the drunkard's foot and drive into his thigh. Every year there are a number of minor accidents of this sort in Cambridge, and there are seasoned roof-climbers who cannot negotiate spikes. Figure 3-1. Spikes. All three rows revolve. Figure 3-2. Over the Railings to the Old Library. At last, the ordeal ended, he finds himself in college, not quite sure whether to be proud or ashamed of himself. 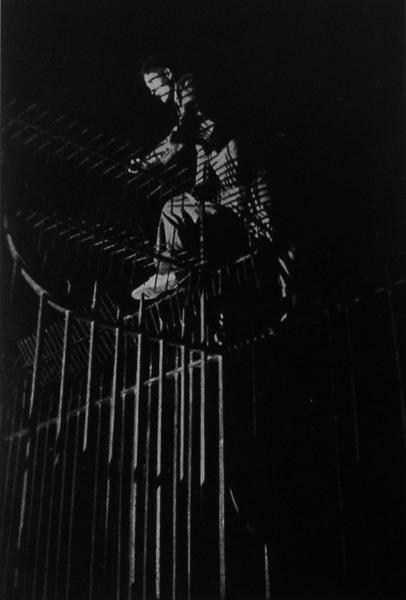 After the first few minutes, sure that he is safe, he is no longer doubtful, and he will often climb in again. He has had his first taste of night climbing. Night climbing is a better term to describe the sport it represents than roof-climbing. For the latter suggests a long ramble between banks of sloping slates, and peering in awe over the edge of a building whose roof one reaches by a trap-door. And many men believe it to consist of this. In point of fact, all night climbing takes place on the face of buildings, and on the spires and towers above the roof-tops. To enter college by an easy but uncountenanced way is the first step to night climbing, though it could seldom be called roof-climbing. By far the greater number of undergraduates stop when they have found a satisfactory way of climbing in. It is the few, the handful of men in each college who are caught by the fascination of buildings by night, who become the night climbers. How or why each man takes to the sport varies in each case. Perhaps a friend has persuaded him into it. Perhaps one of the occasional pictures which appear in the papers of a building crowned with a cap or gown has fired his imagination, and stirred him to emulation. Perhaps he is in one of those few colleges where a fair degree of climbing skill must be acquired before they can be entered at all. One man, locked out of his room late at night by a playful humorist, saw that by climbing a thirty-foot drain-pipe he could enter by the window, and so avoid waking the porter. He became an enthusiastic climber. Many would-be beginners hesitate to start, because they think they would have no head for it. They manage to struggle into college, and because it may be difficult they assume that night climbing would be much more so. And so, perhaps, they confess to someone in their last term, "I always meant to do something like that myself, but somehow did nothing about it". The best answer to this complaint is: Do something about it, now. There must be hundreds of men throughout the university who feel that it is a sport they would like, and who lose it only through failure to make a start. To such men, to anyone who feels even a slight urge to go out climbing, it cannot be too often repeated; start now. Do something definite; make arrangements to go out on the first fine night. By fine is meant any night when it is not raining; for climbs exposed to view an overcast night is best. Find, if possible, a man with experience, however little, of night climbing, and ask him to take you out. If you know of none, then take another beginner, like yourself, and start together. You will be surprised how easy it can be. The fear of heights is the easiest of all fears to cure, though one of the most troublesome while it exists. Giddiness, the mental paralysis which makes its victims unable to do simple things when there is a drop below them, blind fear of heights, all can be cured in two or three outings, starting with easy climbs and small heights. The root of the trouble lies usually in the mistaken attitude of the beginner. Instead of looking at an easy scramble close to the ground and thinking "I could do that", he looks at some forbidding vertical wall which he knows has been climbed, and feels "I could never do that". When told that an impossible-looking building is a field for climbers, he is apt to feel, like a child watching a conjurer, that there is magic in it and it is not for him. So he shies, and perhaps never makes a start. The climber himself is too often responsible for driving away possible recruits. For climbers are a boastful fraternity, very apt to magnify their minor deeds into heroic achievements and the longer climbs into epics. The seasoned veteran loves to point smugly at a building and say "We went up that last night". The way he says it and the sight of the building are enough to discourage all but the stoutest-hearted. If the hearer could see the route up, hand by hand and step by step, he might realize that it was not so very difficult after all. In fact, it is a fairly safe rule to consider any climb as being considerably easier than it is described by the climber. Beginners, not in a position to call the bluff, may take too seriously what is only meant as an armchair gesture. Let the "would-be beginner" console himself with the thought that, provided he sincerely wishes to climb, it is a sport which can be mastered more quickly than any other. The expert who talks so largely is no super-man. Half a dozen outings should bring the novice up to a fair standard, and the "head for heights" will come very rapidly after the first night. Anyone can test his own head for himself. If he can lean out of a window thirty feet from the ground without feeling any fear or discomfort, he has a head which can become trained to climbing. If he can crouch on the outside of the window-sill, holding on to the inside of the window, and still feel no uneasiness, he will make good progress. Not very severe tests? Maybe not, but many who are now good climbers could not at one stage in their lives have passed the second test without some feeling of trepidation. The physical qualifications are such as would be passed by nineteen people out of twenty, and even this is probably a low estimate. A moderate degree of fitness is advisable, but the type of man who wants to climb is not likely to have become .. flabby in his undergraduate days. Strength of arm is more important in roof-climbing than in mountain-climbing. Yet it is surprising how little need be used. A man who can pull on a horizontal bar until his chin is level with his hands should be able to manage the severest climbs. The writer has never yet heard of a climb where a man had to pull himself up with one arm, and it is extremely rarely that he has to pull himself up with his arms without using his legs. What is usually called a "sense of balance", but should more properly be called the art of balancing, is an attribute which grows rapidly with experience, and is closely linked with the "head for heights". Thus the qualifications, mental and physical, are not severe. Yet beginners sometimes complain that they are not losing their fear of heights, even after two or three outings. This is because they are starting on too difficult climbs. A normal man experiences fear when he feels that he is in danger. Even an expert climber feels fear on rare occasions when something goes wrong. Much more so will the novice feel it if the climb is too difficult for him. Without the confidence of knowing exactly what to do, he has the thought of a fall at the back or the front of his mind, and unless he be made of exceptionally stern stuff his climbing will become temporarily inefficient. Secured by a rope on the same climb, he will probably climb confidently and without fear. It is the conquest of this fear that adds half the charm to climbing. However good the climber, there are always climbs just beyond his scope, frightening him until he has conquered them, and himself. Then there is another. Just a shade harder, coaxing, taunting, bullying him until he has made a successful ascent up its defiant length. It is only by seeing how easy have become his early efforts that a climber realizes how he has progressed. He still feels the same thrills, the same excitements as when he started, and as he continues to conquer his fear, greater difficulties step forward to challenge him. And it is a challenge that he must accept if he would continue to go forward, for he may not stand still. A single failure weakens for future occasions the will to reach the top; every success is a gain in confidence. There may be men who have never known this fear, or . have exterminated it by will-power or relentless self-discipline. If there be such men, they must climb as a child skips, for sheer ecstatic enjoyment. For, to the enthusiast, there is a tremendous pleasure to be found even in doing a climb well within his scope, for the fun of doing it. The charm of night climbing is of a kind that is not to be found elsewhere. A certain friend of ours, wanting to climb into St. John's and knowing no easy way, found his way up to the roof and began to test skylights and trap-doors. At last he found one which would open and lowered himself down to arm's length. Not being able to see what was below him, he dropped and trusted to luck. A moment later an unfortunate man. sleeping immediately beneath the trapdoor, was awakened by two feet carrying thirteen stone driving into his side.